WHO WAS JESUS AND WHAT WAS HIS MISSION? Johnakan Ur-El: I want to approach a topic in laymen’s terms, it may sound somewhat disrespectful. I dare to tell you that if Jesus had not evolved, today he would not be my Master, because that Jesus from Galilee was a very limited Jesus... Remember that he was not even in the 5º spiritual plane, but in the 4º. Johnakan Ur-El: And his knowledge was also very limited. Obviously, because of the time he lived in. For the incarnated Masters at the present time many things are “taken for granted” Then, independently of the wisdom that he had in that time, he had at his disposal a lot of knowledge through texts. Therefore, the level of knowledge that Jesús had in that time, today any advanced student already has it. Johnakan Ur-El: I’m not speaking about Wisdom, I don't speak about the lack of attachment the Master had being incarnated. Anyway, it is good to acknowledge that Jesús, in that incarnation, had a lot of knowledge to learn and he disembodied without learning it. Obviously, as well as in the physical plane 1 through different dialogues, opinions are exchanged and many things are learnt in the spiritual planes; one also dialogues telepathically, maybe without losing so much time as in the physical plane, because only "intentioning" an idea, and this idea is already transmitted. I will give an example: your computers can transmit hundreds and hundreds of words through email in a moment. I give this example so that you realize that we in the plane 5, we can exchange a concept in less than one second, and that idea contains hundreds of pages of your books. Johnakan Ur-El: The Master Jesus evolved and for that reason He continues being my Master. At the moment we are in the same vibrational level. The plane 5º , sublevel 9. Interlocutor: Does each plane have 10 sublevels? Johnakan Ur-El: That’s right. We are in the plane 5.9... After the plane 5.9 comes the plane 6, which is an angelic plane. In fact, the plane 6 has the same vibrational Light as the plane 5 has. This was already said in another opportunity, but it is important to repeat it. The plane 5 and the plane 6 are not one above the other. They have the same vibration. It simply happens that the angelic entities are not spirits. Entitiy that came to dialogue: Master Jesus, current Solar Logos. Master Jesus: Here I am again. Interlocutor: Master, before to continue with the session, somebody present wants to ask a question here. Can he do it? Nicolas: In my home, the last year, a phenomenon of mediumship happened. I’d like to know if it was real. Master Jesus: Yes, it was real, it was an entity of the plane 3, that is to say it was not a Spirit of Light, and it was simply a game. In this dear plane 3, which is one of the planes I work with more and I communicate, there are many beings who are in function of Service and they are about to reach the plane 4 which is a plane of Mastery. If they don't end up reaching to that plane it is because of their own ego that wraps them in bitterness, in doubts, in their own and other being's questioning, sometimes making the role of victims and then they are all the time with dual personality. Sometimes they make the role to be Masters of Light and at times it is as though they question everything in bitterness and they obliterate all the good things they had done before. I humbly interpret that that communication tried to bring clarity, but the spirit that has communicated is a spirit of the plane 3 and he didn't have the enough capacity to do it. Spirits of error are generally attached to the physical plane and they try to study the reactions of this plane, so that they learn something or with the purpose to experiment. In the planes of Light nobody experiment with the incarnated beings, in the planes of Light we serve to the beings of the physical plane. Experimenting with the reactions of the incarnated beings is not from the beings of Light. Not even from a Master of the plane 4. We never experiment with beings of the physical plane or spiritual beings from lower planes. What we look for is to put out our hand, metaphorically speaking, a hand to lift them up, but never to experiment because I repeat that Masters of Light don’t do that. Nicolas: And the advice of that spirit to do well to a certain person? Is that ok? Master Jesus: It is Ok fifty-fifty. What I will say is metaphoric: if I were not communicated through this vessel but with your causal body, I would not tell you, localized that you do well to certain person, I would tell you that you do well in general. And then that certain person will receive that Service in addition. The well is not something that one has to give like a "dropper", as you say in the physical plane; it is something that one has to give without limits. If one looks at it from the objective point of view, it’s not bad to say that you do well to certain person, no, not at all. But if we look at it from the subjective point of view, that limits. It’s as if I were embodied and I would write my memoirs from two thousand year ago in Galilee and I’d say "this book it is only for twelve people" and I do well to those twelve people. Then, my metaphoric question is: Am I doing well to twelve people or I am being egocentric with the rest of people that would like to read that book? Then, and it might be an example out of place, but illustrative, it’s not bad to do well to a certain person, but the well is not something localized. Well has to be general, universal. Obviously, if the spirit who was contacted had been of the plane 2, he would have never spoken of doing well. But a spirit of the plane 3 is a spirit that wants to do well but he doesn't have the necessary experience. The plane 4, on the other hand, is a mastery plane where ego no longer has any function because it has no room for it, not only the spirits that are in that plane are useful, but rather they are taught by us, the spirits of the plane 5 how to be useful. Essentially, it is as if somebody were new in an employment and he had all the will, all the desire to act, but he didn't know how to do it and there is a supervisor who is telling him: "look, face this thing in this way, and that another thing in that way", and so on. Then, what a spirit of the plane 4 does is learning how to be useful to the others. Actually, I say this as an example nothing more, because in fact one doesn't learn how to be useful, one directly Serves and period. But sometimes, an orientation given fifty-fifty, as the one given by that spirit of error who contacted, is an orientation that doesn't serve. Interlocutor: Master, I believe that this point has been perfectly clarified. Will you continue with the message you were giving or we continue with the questions? Master Jesus: Let us move on directly to the questions. Interlocutor: Well, Who was in fact Mary Magdalene? Master Jesus: I can visualize to that spiritual being who in the physical plane was called Leonardo Da Vinci who painted that painting so wonderful called "The last supper", and I assure you that the person he represented at my side was my dear disciple, John Zebedee, and not a woman. Interlocutor: The Da Vince Code. Master Jesus: That’s right. That book is completely false from the beginning. Interlocutor: Who was in fact Mary Magdalene? Master Jesus: When she was incarnated, she was a being that loved me as a Master, she respected me, and she has had at times a wrong life. Interlocutor: Was she a prostitute? Master Jesus: Sure, but many people confuse her with that prostitute they wanted to stone and it is not her. For that reason I say that there are misunderstandings. Interlocutor: How was the name of that prostitute they wanted to stone? Master Jesus: Her name was Miriam, but this was a very common name in that time, just like Joshua. Interlocutor: Was Mary Magdalene simply a fervent follower then? Interlocutor: How old was Mary Magdalena when she met you? Master Jesus: She was three years younger than me. Notice that when I disembodied I was 35 years and 8 months old, and she was perhaps 32 years old. Interlocutor: All they say about Mary Magdalene who married to you secretly, and even bore children? Master Jesus: At least not in this universe. Interlocutor: I understand. Everything was a fantasy of authors then. Interlocutor: Where did Mary Magdalene born? Interlocutor: Was she a family friend? Master Jesus: She was simply an acquaintance. Interlocutor: But she was the same Mary Magdalene who was at the tomb and who saw the extraterrestrials there, although obviously she didn't know they were extraterrestrials? Interlocutor: Where was your place of birth? Master Jesus: Bethlehem, August 6 of the year 6 BC. Interlocutor: And the famous Star of Bethlehem? We know that there was in that time an important planetary conjunction, but I want to ask you if there was some space ship guiding the people to the place you were born. Master Jesus: Yes, there was a ship that somehow served as a guide. Interlocutor: And the famous Magi? Master Jesus: Directly they were wise men from the East and they were not kings or magicians. Master Jesus: Those are mythological names they don’t have anything to do with reality. Interlocutor: I understand. How was your life since your 12 years old until your public life began? I ask it because we know very little about it. Master Jesus: I have already said it in other opportunities. I was in India with different Masters, I learned different languages, I studied Buddhism, I studied Brahmanism. I rejected Brahmanism entirely because its karmatic theory didn't fit with me, it seemed cruel. On the other hand Buddhism, with its detachment and with a karma of Service had a lot of common with my way of thinking. Interlocutor: What I don't understand is if you received messages or knowledge directly from the Christic Energy and the Absolute [Eon], why were you receiving those teachings that were surely obsolete? Master Jesus: I learned those things in the same way you can read a book and you can make use of those things that you consider useful and reject those thing you consider useless. Interlocutor: Is it clear, Master. Which was your activity in the places you were? Master Jesus: Service, always the Service, helping the poor and sick. I have learned that one could touch a leprous and not be contaminated. And I am speaking of two thousand years ago, when in later, very dark ages, there was fear of leprosy. Interlocutor: Yes, I remember I read that even they put a bell to the leper's neck to warn other his proximity. As for miracles, today we know that there are no miracles, but extraordinary facts. According to my spiritual guide Ron Hubbard you had three healing genes, when all of us usually have two. Master Jesus: In history there are some people that also had them. For example this vessel, when he was incarnated as Ananda, cousin of Siddhartha, had the three genes. Interlocutor: Does this vessel also have them now? Master Jesus: Correct, but when he was incarnated as John Zebedee he did not. Interlocutor: Does he use them? Master Jesus: He used them unconsciously when he resuscitated his own father. He at the present time is the only person that has been able to resuscitate a person in this way. Interlocutor: Aside from this vessel at the present time Isn’t there someone else who has these three genes? Master Jesus: Yes, there is a 22 year old girl in Russia, called Tatiana Romanova. Master Jesus: No, because she doesn't have the knowledge. Interlocutor: What do these three genes concretely do? Can we understand that technique if you explain it to us? Master Jesus: I have the clear concept of what they do, we will try that the vessel could translate it. My concept is limited to the spoken language. All the human beings have certain energy, a certain aura. The aura can get sick, as well as the physical part can get sick. The aura can weaken and when weakening it can absorb negative vibrations, in the same way, if the aura is strong it can repel negative vibrations. What the genes do is to modify, somehow, the auric system to heal some ailment. But don't take this as a mythological miracle. There have been cases in which with an extra gene a tumor has been dissolved. It is necessary to clarify something which is extremely important. Here a lot has been said about the placebo effect I detect that. The placebo effect can also dissolve a tumor, because it can create an euphoria in the person due to the trust this person has to a certain medicine or the trust to a certain therapist, and automatically channeling unconsciously because one doesn't make it consciously the Energy of the Father, the person can end up emitting such an auric vibration channeling that Energy so subtly that he can end up modifying cancerous cells to such a point that the tumor disappears. Interlocutor: And can that be made immediately? Master Jesus: No, it is not instantaneous but gradual, but in brief time. That is to say that within a week of your time one can end up dissolving it. Interlocutor: But you cured lepers for instance, you made see instantly to blind people, if it is true what the Bible says. Master Jesus: Yes, but not all the cases were like that. Let’s talk about the blind men. There were blind people who suffered of cataracts, others had certain problems. Keep in mind that in that time there was so little hygiene, at least in the town that directly there were people who didn’t have leprosy, but rather they were eaten away by insects. They had lice, they had nits, and they had what you call crabs lice in the pubic part. Interlocutor: Making a joke, did you send them directly to take a bath? Master Jesus: The healings I performed were not as the Bible says, and yes, it is true, to many people I sent them to be cleaned and with that the problem was solved. To some of them water was sprinkled on their eyes so that they could see and it is not true that a hand could grow to a cripple. There is too much mythical thing in all these issues. Interlocutor: Concretely, let’s move on to some overwhelming case, for example, a leper that you have healed. I ask It because the readers want to know. They know that miracles do not exist; instead we call them extraordinary facts that have a scientific explanation. 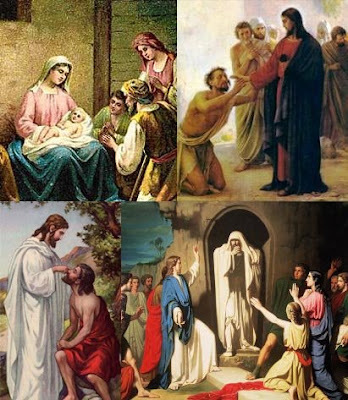 Master Jesus: Directly the third gene is the healing gene that sends that Energy, it can end up modifying certain texture, it can end up eradicating certain virus, certain bacteria or certain fungi or certain dermatological problem and that person automatically can be healed. Master Jesus: No, it is not like that. The biblical writings have falsified the truth. It’s not that a person who has a certain problem is healed when one touches him. Days can pass, even weeks before that happens. It is very easy to write. Interlocutor: I understand what you want to tell me. Then all the healings that you performed have been done during a certain time. Master Jesus: Exactly and I am going ahead of you because I know you will ask about Lazarus. Interlocutor: Yes, it is true. Master Jesus: We know that the body was not corrupted, because not even through the Christic Energy that also is channeled by this vessel that so kindly houses me, my dear disciple, one could resuscitate somebody whose body is corrupted. Interlocutor: Is it clear, Master. And the paralytics? Master Jesus: It depends how advanced the paralysis is. Keep in mind that many paralyses are produced by psychogenic dysfunctions. Interlocutor: I clarify, for the readers who don't know that psychogenic dysfunctions are those that before were called erroneously psychosomatic dysfunctions. Master Jesus: Then, with regard to the psychogenic dysfunctions, even the same placebo effect, provoked by the patient's faith could revert that symptom. That even happens at the present time today to those imaginary sick people. Interlocutor: Are you referring concretely to those pseudo therapists that come from the Lutheran doctrine and who call themselves evangelists and that allegedly perform healings in the stadiums or television programs? Master Jesus: Exactly. But it is not true that a person, who has suffered the illness called Polio, as you call it, is going to be healed by a supposed healer automatically and make him dance as if the illness had disappeared. Interlocutor: Let’s see if I understand, Did you ever touch a sick person and this person was cured instantly? Master Jesus: Yes, yes, that happened. There was a blind person who had cornea problems, and lens, and through an energy of the third gene that unbalanced sight has been stabilized. Interlocutor: Now I understand more or less this issue of miracles. Master Jesus: Ask me a few more questions because the vessel is very destabilized due to the energy I am sending him. Interlocutor: In the Bible there is an episode in which you calmed the storm. Concretely, the question I want to make is if the spirits of Error can influence the weather making focus. Even more concretely, from the spiritual world can you make something to change the weather, to make rain, to provoke storms, etc. Master Jesus: A lot of spirits of the plane 2 would have to gather in order to cause a small meteorological phenomenon. The devastating hurricanes obviously have a planetary origin and nothing more. If we endorse them all the negative things to the spirits of Error, we would be giving them too much importance, too much credit. Yes they can make focus and move small objects, and among many of them they can end up moving bigger objects. Interlocutor: But could they move some clouds to achieve a pluvial precipitation? Master Jesus: Thousands and thousands of spirits would have to gather to change atmospheric phenomena. Interlocutor: Did it happen? I ask it because of those famous phoneys in the United Stated that went from town to town with a cart filled with eccentric artifacts and who promised to make rain in exchange for big amounts of money. Master Jesus: They were as you said, phoneys, and if it rained, it was mere coincidence. Interlocutor: And the cure of possessed people? Master Jesus: A demon cannot possess any embodied being due to an issue of free will. Even the strongest demon, if it existed, could not take possession of any body. In the cases they do it, and this was already clarified in previous sessions, it is because an embodied being “opens up the door” to the shepherd or the priest, and then he allows the demon to enter. You may have seen in different temples how those possessed people writhe and wriggle on the floor, with convulsive spasms expelling foam through their mouths. Interlocutor: Well, everybody has seen them because those circus shows appear on television. And How did you do to solve that? Master Jesus: Directly I sent them Christic Energy that automatically rejected all demons. The Christic Energy cleans everything. Interlocutor: Did the extraterrestrials help you at some time with the healings? Master Jesus: No, with the healings never. Yes they have made me radioactive in the episode the Bible calls the Transfiguration. Interlocutor: Master, how did you perform the multiplication of the loaves and the fishes? We know that they were extracted from a parallel universe. Master Jesus: Yes, that was already said. Interlocutor: Did the Christic Energy intervene? Master Jesus: That’s right. That Christic Energy was granted to me since the moment my cousin baptized me in the Jordan river. Interlocutor: It’s clear. to end this session, if I asked you which was the fact that impacted you more when you were embodied two thousand years ago, what would you tell me? Master Jesus: I’ll respond and I’ll leave, the moment I fell in love with Miriam at Jacob's Well. We’ll talk again soon. This entry was posted at Thursday, August 06, 2009 and is filed under Biblical mysteries . You can follow any responses to this entry through the .